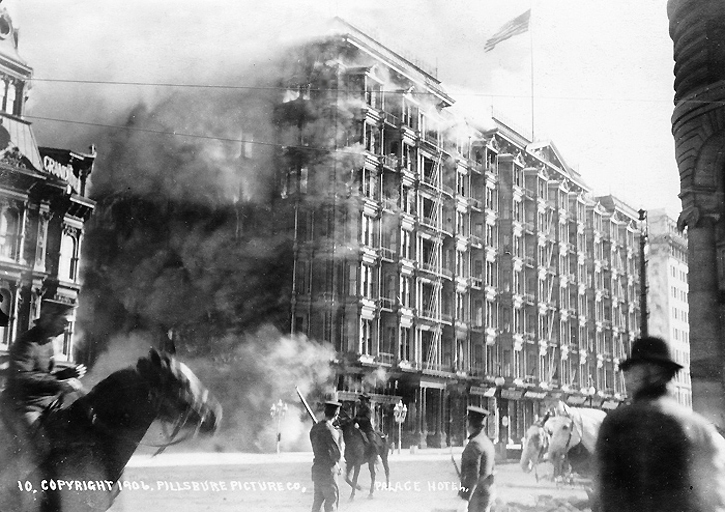 Fire in the heart of San Francisco following the 1906 earthquake. An estimated 3,000 people died in the event. Photo courtesy of the Center for Military History, SC95197. 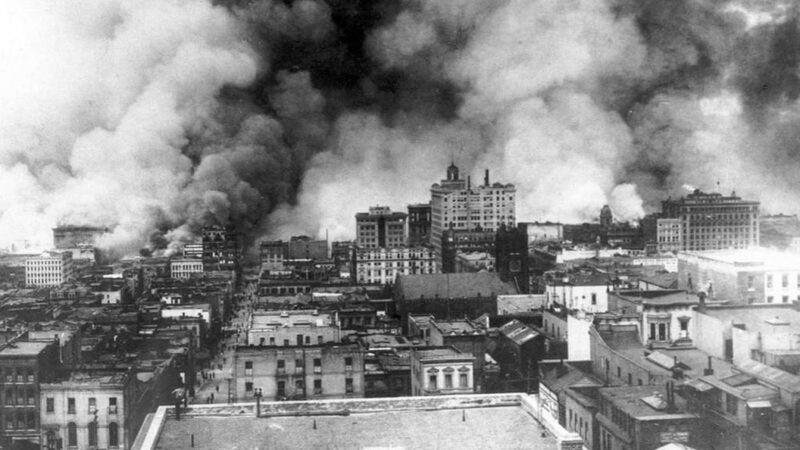 The destructive San Francisco earthquake of April 18, 1906, gripped the nation and dominated headlines. The Oregonian newspaper had their own exclusive scoop—owner and publisher Henry Pittock survived the earthquake and its fiery aftermath himself. 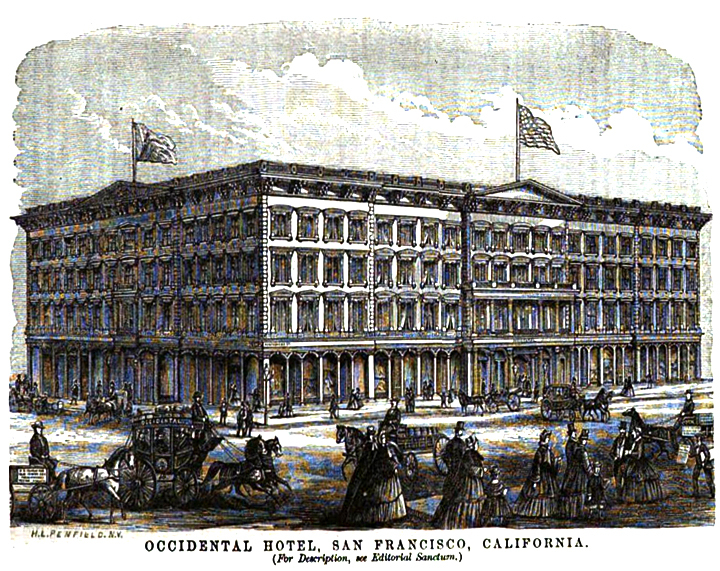 The Occidental Hotel, where Henry Pittock rode out the 1906 earthquake. It burned in the fires that followed. Engraving by H.L. Pennfield. Courtesy of Gazlay’s Pacific Monthly (Vol. I, No. 3, April 1865; p. 362). Pittock had experienced an earthquake a year before in Guadalajara, Mexico, and reacted calmly. He noted that furniture had been tossed about and the halls were filled with rushing people, but after determining his door still opened, he concluded the best course of action was to go back to bed. 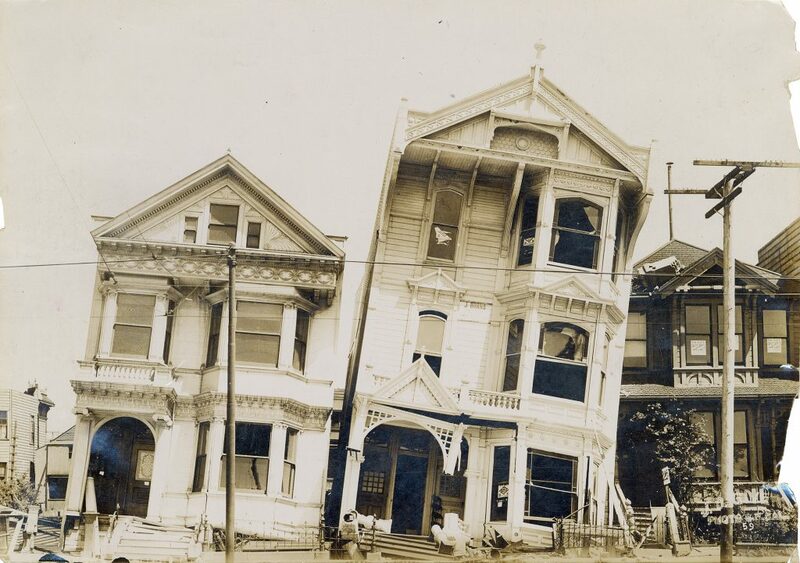 Houses damaged by the 1906 earthquake. Photo courtesy National Archives No. 1. RG 46, Records of the United States Senate, National Archives. When it grew light, Pittock noticed pieces of plaster had crushed his suitcase and fallen on his bed. He left the hotel to look for breakfast amid the sounds of explosions, as firefighters began dynamiting buildings to stop the fires spreading through the damaged city. He found bread, butter, and coffee at neighboring St. Francis Hotel, then sought to send a telegram back to family. He tried first at the Associated Press building, but was ordered to evacuate as the structure next door “might be blown up at any minute.” He next discovered the telegraph line at the Bulletin newspaper was dead. Pittock spent the rest of the day watching the fires that eventually consumed almost 500 blocks. His hotel burned that evening. After finding no dinner, he spent the night on the streets. The Palace Hotel, located a few blocks from the Occidental Hotel where Pittock stayed. Pittock found water at The Palace Hotel for washing on the morning of the earthquake. It burned that afternoon. Photo courtesy of the Palace Hotel. 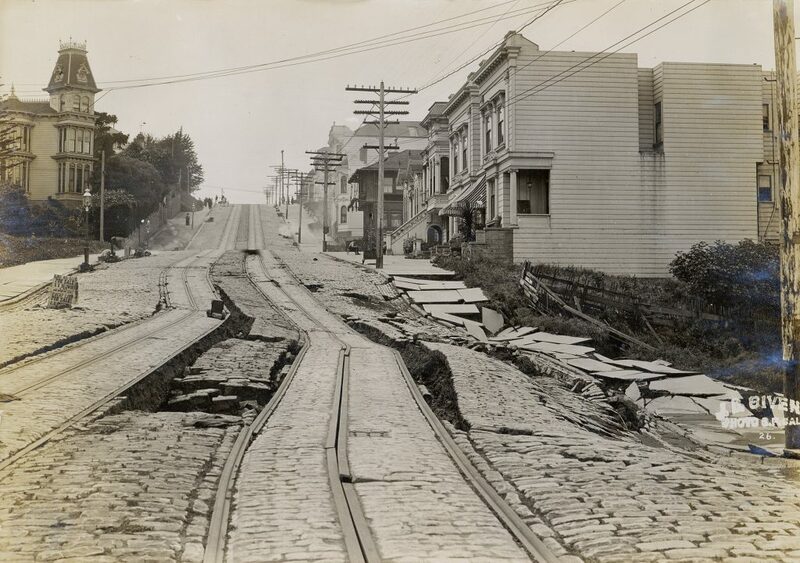 Damage to a San Francisco street after the earthquake, 1906. Photo courtesy National Archives No. 1. RG 46, Records of the United States Senate, National Archives. Overall, Pittock was impressed by the calmness of the residents, despite the destruction. The only looting he saw was hungry people taking food from a market, and he even observed “a young couple in the park who were holding a musicale with a violin and a guitar.” He also noted how well steel structures withstood the earthquake. When building Pittock Mansion a few years later, he commissioned a house using reinforcing steel in the basement, and fire-resistant materials like concrete. Before the earthquake he also had “never thought that very much of the automobile before,” but was impressed when he saw cars ferrying supplies and the injured, while horses stopped when water ran out and thirst set in. 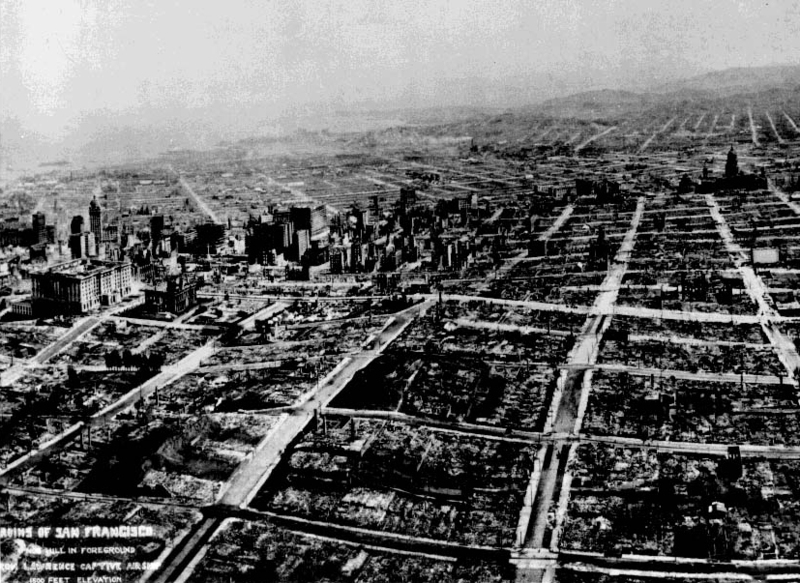 San Francisco, five weeks after the 1906 earthquake and fire. George Lawrence took the photograph from a camera suspended from kites. Photo courtesy of Harry Myers. Interested in learning more about historic natural disasters and disaster response? Check out our current exhibit, Forces of Nature:Historic Portland Floods, Fires, Ice & Snow!